What Has GIS Done for Me Lately? Who would have ever thought those three letters would bring so many people together to create so many solutions. Geographical Information Systems. If I had a penny for each time I was asked, What is GIS? I could take another trip to London for free. Of course, the way I describe GIS now is much different than the textbook definition I learned as a newbie. Now I can relate GIS to anything. As professionals, we are constantly seeking out ways to enrich the lives of others through developing the latest killer app or maximizing the return on investment. We chair boards, develop standards, begin grassroots organizations, connect people, volunteer, mentor, and never say no. We learn to develop plans and form committees. While we are just being ourselves, we are also gaining personal and professional relationships becoming known as a subject matter experts (SMEs). 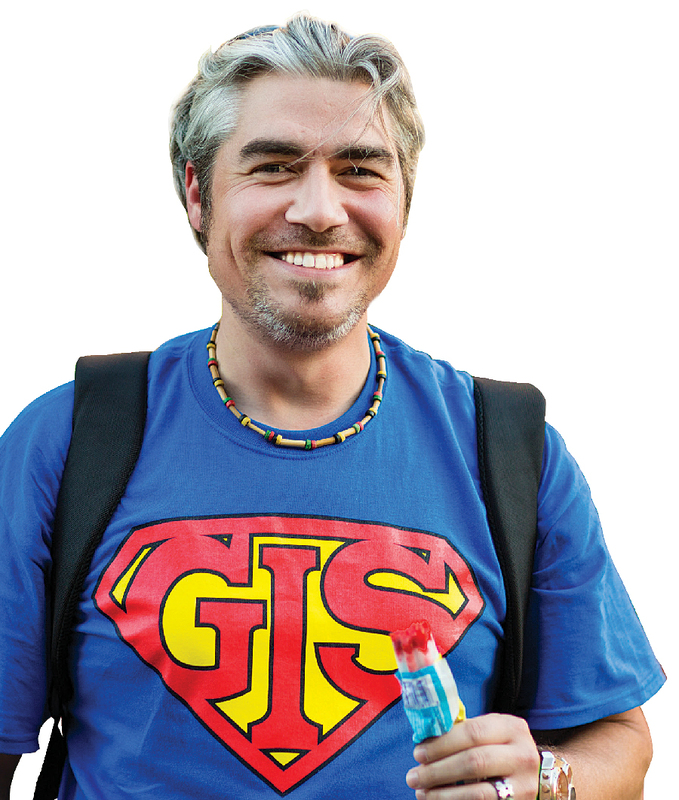 We earn specialized credentials and advance our careers—all because of GIS. Think about what GIS has done for you lately? Yes, GIS let me apply my specialized skills but more importantly to learn. I’m still learning and plan to continue learning and applying those lessons. Like everyone else in this industry, I’ve worn many hats during my 10-year tenure in IT and GIS. I have been happy to be entrusted to wear those hats because I am absolutely passionate about GIS. GIS gave me a chance to apply my skills and help others. GIS has been the most rewarding career of my life. I am honored to say how thankful I am to be a part of this field. You should look back over your own career, either by pulling out your “about me” book or by creating a road map of your successes, and celebrate the positive contributions you have made to your community and your world. Look back at how far you have come, where you are, and look forward to where you want to be. During a URISA Conference held in Portland, Oregon, in 2008 I met Jack Dangermond. Wow. He is to GIS what Mr. Gates is to Microsoft. Meeting Mr. Dangermond truly was a professional highlight of my career. I didn’t know how GIS is the common thread that brings the world and people together until I left the conference and returned to Columbus. This epiphany came while working alongside another Hazus practitioner, Terry Jackson (GISP). We were trying to solve a problem with our Hazus software installation. At some point, we were talking about where our career had taken us and who we had met. I learned that Terry and I had many of the same colleagues and friends and he had also met Jack. Small world. Terry knew Jack while he worked for Esri. He went on to describe the wonderful experiences he had while working with Esri. He shared how Jack and his wife went out of their way to personally helped him by driving their spare car into the desert while he was stranded, once upon a time. Among many things, Terry is an archaeologist. I wondered later, if archaeologists really ever get stranded? I said that because of our profession, we are not separated by geography or jurisdictional boundaries. Others often know us by our reputations and contributions to the community and profession. We are remembered for what we do for our world and for others. GIS builds relationships. We are all interconnected through this amazing profession of ours. Our roles change and evolve during our GIS careers. I grew from a technician to an interim GIS coordinator to a team leader and project manager to a GIS supervisor and a Hazus-MH professional and Hazus-MH practitioner—all while working for the same organization, Columbus Consolidated Government. A list of just a few things that our GIS team has done for the City of Columbus, Georgia, include growing our division; saving the city more money than the average annual budget for the division; developing strategic action plans and road maps; starting executive steering committees, working groups, user groups, and newsletters; holding GIS Day events; internal and external training; and volunteering. We’ve administered budgets, analyzed business processes, created lots of workflows; developed and acquired data; created thousands of maps; designed and integrated databases; created models; implemented geospatial systems; both created and broke services; wrote scripts and programs; created algorithms; improved addressing; and created and enforced policies. We’ve had some wins and some losses. We wrote technical documents that needed to be managed, stored, and administered. My manager and I decided to design our technical standard operating procedures database so it could be used daily as a vital component to our workflow. To get the idea off the ground, I worked with IT. We began by designing a Lotus Notes database to store our technical standard operating procedure documents. Storage wasn’t the primary purpose of the design, workflow organization and management was. This database included scheduled tasks based on the technical standard operating procedure. The database included a matrix describing our core responsibilities. We created specific user requirements to serve our needs. Our team was surprised to learn that collectively, we provide 172 GIS services to Columbus Consolidated Government throughout the year on a daily, weekly, monthly, quarterly, or yearly basis. With so many tasks, this became a great workflow tool to organize and manage our growing list of tasks. The functionality included reminders embedded in our calendar system. A user profile was created for each GIS user. Calendar entries were used to schedule each task. An e-mail notification was sent a few days prior to the date due. Part of the design included notification of a designated backup person who could complete the task in the event the person originally tasked was out of the office. Once the database was designed, the only thing remaining was uploading the documents into the database. It is clunky but effective and efficient. We strive to save time and think outside the box using what we have to do more with less. GIS has enhanced public safety, fire EMS, 911 services, taxation, public works, and all city services by creating behind the scenes benefits for the 190,000 residents; 50 departments; 44 boards, commissions, and authorities; and 167 Columbus Consolidated Government business units. But most of all, I know what GIS has done for me lately. It’s allowed me the privilege of keeping someone safe, providing fairer taxation developing solutions, making folks smile, of making a difference in the lives of others and in my life. That is the best feeling of all. My journey hasn’t ended in Columbus. It has taken me from Columbus Consolidated Government to a new chapter of my career as the GIS technology manager for the Troup County, Georgia. Thank you, Esri for your vision and the Columbus Consolidated Government. “What has GIS done for you lately”? Shondra Helen Hogan is a GIS Professional (GISP) with more than eight years of experience in this field who holds a degree in business administration. Hogan is a GIS Corps volunteer for URISA. She has served as a project manager on behalf of the State of Alabama’s Emergency Operations Center, the American Red Cross, and the State of Alabama’s citizens alongside a worldwide team following the aftermath of violent tornadoes on April 27, 2011, that devastated the southeast United States. The team developed a crowdsourcing application designed to identify road closures, fallen power lines, shelters, and essentially match every need reported with a solution. An avid volunteer in her community, she has served as vice chairman of the Executive Advisory Board of the Mayor’s Committee for Persons with Disabilities since 2011 and served as chairman of Columbus’s Accessibility Guide Subcommittee for two years. In 2011, the Executive Advisory Board honored her as Committee Member of the Year. In 2009, she was given a proclamation from Mayor Jim Wetherington for her outstanding service and contributions to the community. She is a member of Georgia’s Urban Regional Information Systems Association and Columbus’s Community Emergency Response Team. She is also an alumna of Columbus’s Citizen’s Law Enforcement Academy and the University of Georgia Carl Vinson Institute of Government. For more information about designing simple workflows, process improvement, or business analysis, contact Hogan at shogan@troupco.org or shondrahelen@icloud.com or at 706.761.6899.